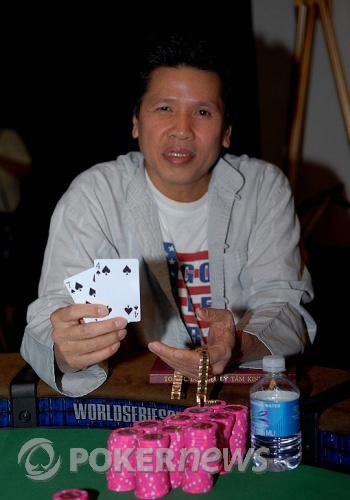 Congratulations to Dao Bac, who won his first ever gold bracelet at the World Series of Poker for his first place finish in the $1,000 buy-in S.H.O.E. event. Bac took home a paycheck worth $157,975 for his efforts. Dao Bac completed the bet from the small blind, after which Adam Geyer made it 60,000 to go; Dao called. The flop came . Bac checked to Geyer who bet 30,000, which was met by a reraise from Bac; Geyer just called. The came on the turn and Bac once again checked to Geyer, who bet 60,000. Bac then check-raised a second time, upping the ante to 120,000. By this time, Geyer found himself pot committed and moved all-in for 30,000 more; Bac called. When they turned their cards over, Geyer held a commanding lead, revealing for a pair of 7's with the top kicker; Bac showed a mere and was drawing to a 6 for a gutshot straight, or a 4 for two pair. Amazingly, the was the last card off the deck, giving Bac his two pair and the gold bracelet. For his second place finish, Adam Geyer received $86,691 in prize money. Adam Geyer raised from the small blind and Dao Bac made the call. The flop came and both players checked. The fell on the turn and Geyer checked to Bac, who bet 60,000. Geyer then moved all-in for 15,000 more and Bac made the call. When the cards were revealed, Geyer had the lead, showing for top pair with a Jack kicker; Bac turned over for a pair of 9's. 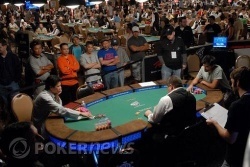 The river brought an irrelevant , and Geyer doubled up to right around 250,000 on the hand. Adam Geyer completed the bet from the small blind and Dao Bac raised it up to 60,000 from the big; Geyer called. The came on the turn and Geyer checked to Bac, who led out with a bet. Geyer then check-raised Bac, making it 120,000 to go, after which Bac reraised to 180,000; Geyer just called. The fell on the river and Bac made one last 60,000 bet that was called by Geyer. At the showdown, Bac revealed ; he had flopped a straight. 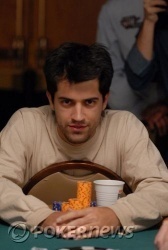 Geyer mucked his hand and dropped below 200,000 chips as a result. Bac completed the bet to 30,000 showing the ; Geyer called. Bac bet again on 4th street and Geyer made the call. After receiving the on fifth street, Bac led out for another 60,000, which made Geyer fold. Very little action ensued over the next seven hands. For the most part, Bac and Geyer exchanged bring-ins and antes, but neither gained any significant ground. Geyer did, however, take down a small pot on Hand 152. Bac had bet 60,000 on sixth street, but folded when Geyer raised it to 120,000. Bac brought it in for 10k showing the ; Geyer called. Bac received the on fourth street and bet 30,000 and again, Geyer made the call. Both players checked on fifth street, but Bac bet another 60,000 on sixth when he was dealt the ; Geyer called. Bac fired one last 60,000 bet on the river and Geyer folded. Bac brought it in for 10,000 and Geyer completed the bet to 30k. Bac then made it 60,000 to go and Geyer called. Bac bet 30,000 on fourth street and Geyer called. On fifth street, Geyer had first action and passed to Bac who pumped another 60,000 into the pot; Geyer folded.